Take Charge To Maximize Your Library’s Online Presence - An article by Len Bryan in School Library Journal, May, 2016. - Many suggestions if you are planning a new site or looking to improve your old one. Using Your School Library Web Site in Instruction - This is a slideshare presentation by Kenya Arrants. 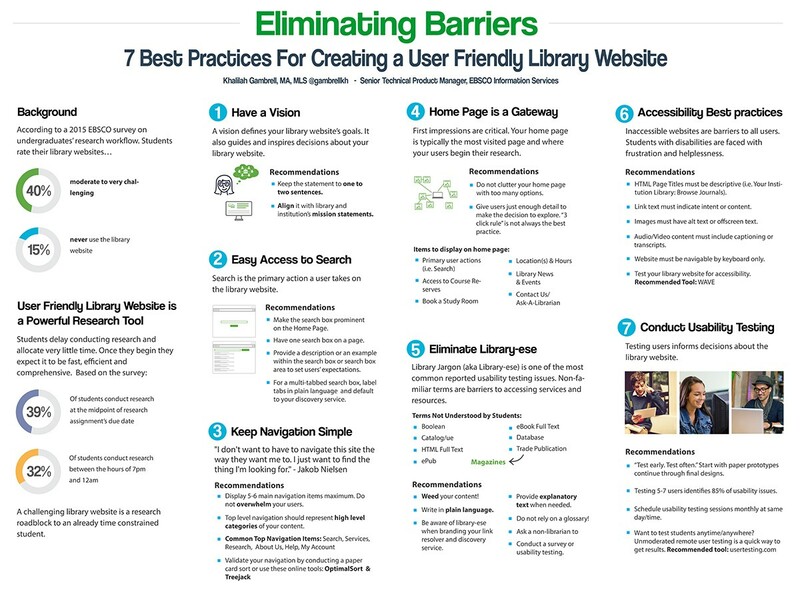 Eliminating Barriers: 7 Best Practices for Creating a User Friendly Library Web Site - From Ebsco. How Usable are School Library Websites - A study by Anthony S. Chow and Rebecca J. Morris in The Journal of Research on Libraries and Young Adults, June 2016. This study finds that school library web sites rate low on design appropriate for the students using them. Suggestions are given for improvement. Web Design that won't get you in Trouble - The legal issues in developing a library web page. Article by Shirley Duglin Kennedy in Computers in Libraries, June, 2001. Guidelines for Designing Successful School Websites - by the Connecticut Department of Education. Usability of Web Sites for Teenagers - Points to consider in the design of web sites. By Hoa Loranger and Jakob Neilson, February, 2013. Web 2.0 in School Libraries - If writing a web site looks difficult, you might want to do a blog or wiki. Look here for more information on web 2.0 applications such at blogs, wikis, and social bookmarking. Web4Lib - Electronic discussion group for library web site managers. Virtual Library Guide to Writing Your Own Web Page - Browsers, HTML, graphics and other page writing aids. School Library Website Examples - From the School Library Association. LibWeb : Libraries on the Web - This is a long listing of public and university libraries with web sites. Visit a few of these libraries to get ideas on how to design your web page.